I want to take a moment to tell you about what the rescue community calls "Foster Failures." It's meant as a humorous term! A Foster Failure is someone who was fostering an adoptable dog for a rescue, but they fell madly in love (head over heels!) for their foster dog and, well, decided they just couldn't let them go so they decided to adopt the dog themselves! We had 3 foster failures in this month alone! Our foster adoptions take priority over outside adoptions since a foster has already opened their home to a homeless pup and gave them so much love when they needed it the most. Fostering is one of the hardest things I've ever had to do, because it hurts so much to let them go. I hope our adoption applicants understand. We have so much love and respect for our fosters. They selflessly open their homes to dogs who may be sick, or not housebroken, or injured; and they do it without hesitation. We couldn't do any of this without them. On that note, we'd like to congratulate Milton, Daphne and Sora for finding their forever homes (even if they found it months ago!). We love these pups and their amazing fosters (I mean owners! ), and we will them all the happiness in the world! 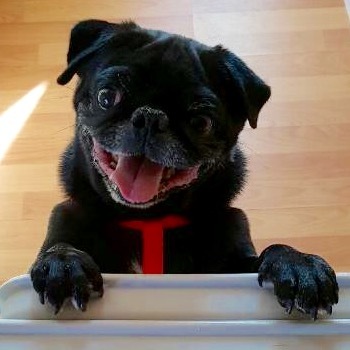 We reached our goal for Milton's Dental Work!!! We want to thank everyone who donated to help out this sweet Pug in need; we couldn't do this without you! We also want to thank everyone who shared Milton's fundraiser. The support from our community is truly an inspiration! Thank you all so much!! Milton is a 6-year-old Pug in the El Paso Pug Rescue who badly needs dental work. His teeth are in extremely poor condition. Before he can go to a forever home, we will need to fix his bad teeth. With a few donations, EPPR can afford to get him the dental work he so desperately needs, so he can find his forever home! Even the smallest donations help!